Brett Preston made no bones about it, I need a place to go!, and Read. How many layouts have you seen without any place for the people to relieve themselves, there wasn't even toilet paper until 1931. Movies bother me, terminal constipation, they never go, they never eat, they never drink. 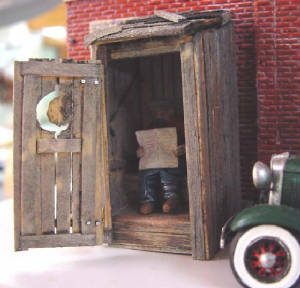 This cute little kit includes a door hinge, outhouse base cast in hydracal, basswood and roofing, plus sources for a figure to sit inside. what a suprise when the door is opened.